Credit: F. W. Taylor. Composite image: W. Thornhill. Late pertinent information: The polar caps of Earth have now been shown to be filled with supersonic outflows of plasma. Is this a standard feature of planets? This polar “vortex” on Venus is the hottest spot in the planet’s upper atmosphere. The diameter of the “collar” around the vortex is about 5000 km and the temperature contrast between the hottest part of the chevron-shaped dipoles and the coldest part of the collar is about 45 K. The configuration was not expected, and it remains an anomaly. 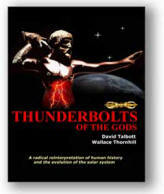 Electric theorists, however, say that Venus is highly active electrically due to its unique origin and comet-like past. They will tell you that astronomers and astrophysicists, having received no training in the behavior of electric discharges, fail to perceive such electrical phenomena, so they are continually straining to explain electricity’s unexpected effects. To a plasma cosmologist, the polar vortex is a cross-sectional view of a cosmic electric current. Within the solar system, as in every observed region of space, electric currents flow over vast distances by means of filaments of plasma that tend to organize themselves into “twisted pairs.” A common name for this “doubleness” in current-conducting plasmas is “Birkeland currents”. All the features shown above suggest that the two hot spots are the “footprints” of cosmic Birkeland currents. The "giant vortex" and its "surprisingly complex structure and behavior" are the energetic effect of twin currents flowing into the planet’s atmosphere at the poles. In fact, the Venusian dipole shows both the configuration and the motion of Birkeland current pairs in plasma discharge experiments and in super-computer simulations, including the surrounding spiral vortex. 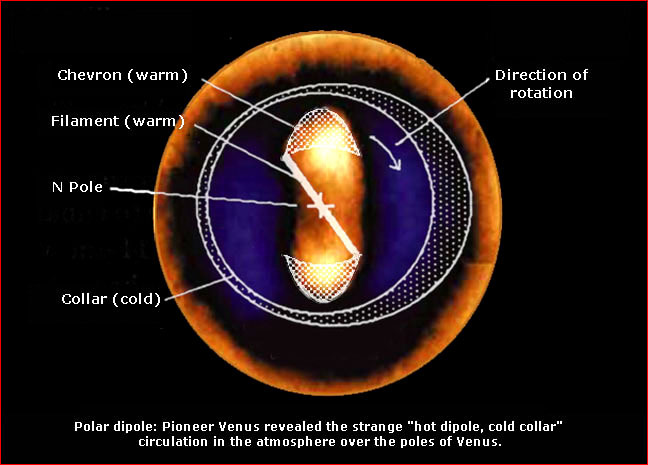 The polar dipole exhibits an enhanced infrared emission, a predictable effect of the dissipation of electrical energy in the upper atmosphere of Venus. It has a variable rotation rate, and the position of its axis of rotation with respect to that of the planet varies as well. It was observed to move 500 km from the Venusian pole in less than a day and return just as quickly. These movements find a ready explanation in the variable nature of the electrical input to Venus via the Sun, and the snaking about of the Birkeland currents—again, a predictable feature of electrical input. It should be noted that Peratt’s simulations were done before the discovery of the Venusian dipole and were offered as an explanation of the electrical forces that produce spiral galaxies, the grandest cosmic plasma discharge phenomena in the universe. But the enormous scalability of plasma phenomena demands comparisons of this sort. The currents that form the Venusian polar dipole exhibit the same features apparent in the formation of a spiral galaxy from the interaction of two intergalactic current streams. The fact that a filamentary connection between two current “hot spots” occurs in laboratory discharge experiments, in computer simulations, on the planet Venus, and in galaxy formation suggests that a more unified picture of the universe is now possible. Professor F. W. Taylor is Halley Professor of Physics at Oxford University. ** Anthony L. Peratt, "Physics of the Plasma Universe," Springer-Verlag, 1991.